Welcome to Chicago Lawn Mower, Inc.
We are a third generation family owned and operated business that has served the needs of residential lawn and snow removal power equipment users for over 50 years. We service residential lawn mowers and snow blowers and give free estimates. Sorry we do not work on any handheld equipment. We sharpen most hand reel mowers (American made). We sell new quality lawn mowers and snow blowers at big box store prices. 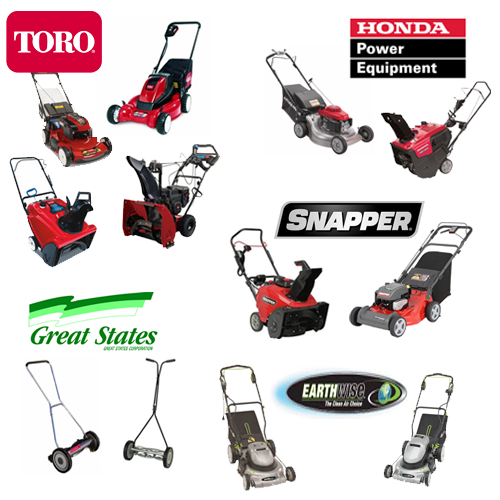 We carry new Toro, Honda, Snapper, Earthwise, and Great States lawn mowers and snow blowers, as well as a variety of reconditioned used equipment. We setup, demonstrate and test run (after purchase) equipment. We service all equipment on site, and carry most common or fast moving parts on hand. Long before the Big Box retail stores opened, at Chicago Lawn Mower we serviced all equipment we sold. We do the exact same today. As authorized Honda and Toro equipment dealers; you can have confidence your purchase will be serviced by us for these and just about every residential power equipment manufacturer available. We have 100's of in stock new and used units available, and When your equipment is purchased locally, rest assured your equipment is ready to use and a complete demonstration of use is always provided. For the do-it-yourself crowd we stock only genuine OEM and high quality aftermarket new and used replacement parts, from manufacturers you've grown to know and trust. We have machines for the green minded residents. 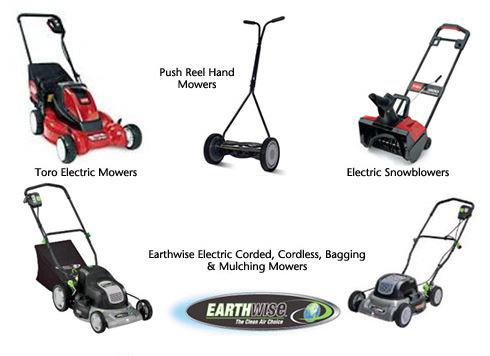 We carry Earthwise corded and cordless electric lawn mowers, Toro cordless battery operated mowers, and traditional hand reel mowers to reduce carbon base emissions. Chicago Lawn Mower launched its retail e-commerce solution on Ebay as mowandsnow, for purchasing parts and equipment in 2006 by listing a handful of commonly purchased replacement parts on eBay. Today mowandsnow has a complete online parts store, as well as a eBay, Bonanza, and other E-stores and enjoys a stellar reputation as an eBay power seller; Since we stock plenty of most commonly used items, you're assured we will turn around your order and have it shipped within 48 hours. Thank you, your expert team at Chicago Lawn Mower, Inc.